By stoat on April 14, 2016. Alan Jeffers, a spokesman for Exxon Mobil, called the new allegations absurd. "To suggest that we had definitive knowledge about human-induced climate change before the world’s scientists is not a credible thesis," he said. The documents, according to the environmental law center’s director, Carroll Muffett, suggest that the industry had the underlying knowledge of climate change even 60 years ago. "From 1957 onward, there is no doubt that Humble Oil, which is now Exxon, was clearly on notice" about rising CO2 in the atmosphere and the prospect that it was likely to cause global warming, he said. Yes, that's right. One of the "damning" quotes - so damning it needs to be outlined in scary yellow - is simply quoting what Revelle had already told anyone who was prepared to listen (ter be honest, I don't understand the second sentence. I can't tell if that's the report stating it as a fact, or whether they are quoting Revelle. The sentence is stupid though, so is unlikely to be Revelle: significant temperature changes *are* climate changes. Notice that sentence doesn't say the changes will be upwards). However, the idea that the available science in 1968 justified doing anything is also stupid. The blockquote ("In 1968...") above misrepresents the state. The report itself is available here except it isn't the whole report. Its only selected bits. I think that's dishonest of them; I think they're deliberately avoiding putting bits of the report they don't like online. But even that fails. FFS, these people are cretins. I think their quote "They cautioned that rising levels of CO2 would likely result in rising global temperatures" is a lie; I certainly can't see a source for it, and it would be directly contradicted by what I've inlined above. The report does say, and I paraphrase slightly, that "if the temperature increases significantly then some things will happen, like Antarctic melting, sea level rise, warming of the oceans, blah blah blah". You may call me overly picky, but I don't think a report that warns that temperatures going up might, just possibly, lead to warming gets many points for depth of perception. Nor do they get much for T up implies SLR; or even Ant melt. * Exxon’s Support of a Tax on Carbon: Rhetoric or Reality? * AGU BOARD VOTES TO CONTINUE RELATIONSHIP WITH EXXONMOBIL AND TO ACCEPT SPONSORSHIP SUPPORT - they're rather shouty about it. * The “Exxon Climate Papers” show what Exxon and climate science knew and shared - archive of post by Andy May at - gasp - WUWT. It isn't actually good, due to not being able to accept the current state of the science, but largely agrees with what I've said; and provides useful links to some of the papers. Also available from a less tainted source if you prefer. What Exxon Knew and When, round three? Mate. How about dropping the abuse. I am not sure why you get so worked up by this but it is a legitimate area of research. Try this page from that report. And the issue is not so much that Exxon knew since as you point out a lot of this knowledge comes from publicly available research as well their in house expertise. The issue is their subsequent campaign of manufacturing doubt despite what they knew. Why is it any different to the tobacco industry? The research in to the health effects of smoking were similarly public and were initially uncertain. But that did not save the industry from the condemnation that their campaign of manufacturing doubt attracted. Wait, I'm confused. I thought the basic pillar of CO2 warming was based on the calculations of Svante Arrhenius 120-years ago. Didn't he predict that this could possibly melt the polar caps and prevent the next ice-sheet advance? Is the current theory that the evil-doers at Exxon successfully cloaked Arrhenius' science from the world, then, once their own scientists reconstructed the theory, they had them silenced, thereby depriving the world of an additional 20-years of CAGW chicken-little scare-tactics that no one listens to? I seem to remember a recent celebrated paper about climate nutters wallowing in conspiracy ideation. The fixation on Exxon seems just another disturbing manifestation. Cue one Naomi or the other damning Colonel Drake, for reading Tyndall's 1859 Philosophical Magazine hydrocarbon vapor & climate expose' and up and inventing oil wells anyway. The sentence is stupid though, so is unlikely to be Revelle: significant temperature changes *are* climate changes. Surely the sentence is an early example of the disentanglement of "global warming" and "climate change"? Disagree. The late 19forties and the fifties were a third round of GHG/climate change debates (after Arrhenius' pubs and a round in the twenties) and this decade resulted in quite a consensus. What followed was a big run of climate, atmospheric chemistry research with funding generated in some extra measure related to the International Geophysics Year, 1958. This is why the Keeling Curve (and some others) start there and then. Depends, and not the adult nappy kind. I think the report is clear that rising CO2 will cause warming, all else being equal. The sticking point - the McCormick and Ludwig theory - concerns cooling influence from anthropogenic aerosols. Which would win in a tug of war between CO2 and aerosols seems to have been the debate of the late-60s/early-70s, with CO2 triumphing by the late-70s. There's the discussion of CO2 influence on the greenhouse effect and model temperature change predictions of warming. There's no explicit statement off likelihood, but reading that excerpt I get a clear message: more CO2 = higher temperatures, just a question of how high. They note that the simple model may be overestimating the amount of warming but don't appear to provide any caveats to suggest a possibility that rising CO2 alone might not cause any warming. Maybe there are elsewhere? The report itself appears to completely unavailable online. If they had to obtain it from a library there are copyright rules about amount of scanning allowed, I think 5% is the unusual guidance. For other cited documents they provide links to complete papers, which suggests it's not a matter of honesty, but availability. Re AGU: $35,000 to serve breakfast for a few geology students? San Francisco is expensive, but still. Welcome to the group who believes that US securities laws and regulations are incomprehensible if you don't pay a high priced law firm to take care of the details for you. Shorter: when the exact wording of the official information provided to stockholders fails to assess a risk then disclosure is insufficient. No matter what "everybody knows" about the subject, if it's not in the disclosure forms, it didn't get disclosed. The gap between official securities disclosures and reality is rarely narrow; it's a gamble they take that things won't go badly soon, so they don't mention anything too far out in the future that might discourage anyone from buying the stock right now and holding it. "Re AGU: $35,000 to serve breakfast for a few geology students? San Francisco is expensive, but still." The current estimates of potential damages are not clear. No policy has been agreed to. No strategies for banning or phasing out oil and gas have been made. Exxon still does not have a clear picture of the risks to their shareholders. By getting and staying behind the AGU consensus, you can bet that they plan on having a significant influence on developing a more big-oil favorable consensus on policy. "Exxon still does not have a clear picture of the risks to their shareholders." The serious legal issue isn't shareholders, it is selling bonds. If you go buy shares of Exxon on the open market, no disclosure is required. A bond is a promise to repay, and is legally far more protected. A share is a share in the profits, if any, and is far less protected. Now you might think the law is silly, but I think all the disclosures for getting a mortgage to buy a house was silly as well. The investors in mortgage backed securities probably would disagree. See crisis, financial, of 2009. And yes, people should have gone to jail over that. Excuse me, but you're missing the point. Almost all the shares are held by companies, banks, retirement accounts, and so on. They don't have half a brain. They are lockstep robots that do exactly and no more than the regulations and law requires about checking facts. If it's not in the official mandated SEC-regulated disclosures, it's not a fact, for those shareholders. Nobody's saying this is a good thing for people. People are a minority in the US legal environment these days. The big players aren't people, and don't have brains. P.S. -- here's the real core problem. The US, as of the New Deal, could have regulated the securities and bonds and banking and accounting businesses and made them fiduciaries, responsible for doing the right thing for the customer first and foremost. That did not happen. Your doctor, your dentist, your lawyer, your plumber, your electrician -- they're fiduciaries, essentially. They're licensed and they have a knowledge base and expectation about how they practice. Your securities, bond, bank, accounting professional have "generally accepted practices" that are intentionally vague and imprecise. The supposed solution here was -- "disclosure" instead of fiduciary responsibility. Oh, nothing _exactly_, just what generally accepted principles in the business considers important. This is much studied -- but little known by the general public or the climatologists and programmers who opine about public policy. They could do some reading. ... We continue this line of research by developing the rationale behind the argument that symbolic legislation might be sufficient to restore investor confidence. We ... posit that securities legislation can best be understood as an effort to reestablish the viability of what has been labeled the “American dream”. We concur ... that passage of the securities legislation must be examined as a response to a moral crisis of capitalism, generated by the “immoral behavior” of the capitalist elite. We then focus on the framers of regulation and the accounting profession...."
We characterized the accounting provisions of the securities legislation as “symbolic”, designed to still public outrage, without resulting in significant wealth distributions. Dewey (1935) states that symbols, such as the SEC legislation, “are significant only in connection with realities behind them . . . they are often used in party politics as a substitute for realities instead of as means of contact with them”. The symbolism is merely “propaganda”. The question Neu raised, of how the securities reformers expected legislation to restore confidence, we suggest, must be examined in light of the strong ideological commitment that all reformers had to the American dream. That dream encompassed a coordinated set of ideas and beliefs related to how the unequal distributions of income, generated by a capitalistic economy, could be reconciled with the need of an independent middle class to preserve the democratic polity. If the majority of the nation’s citizens could become “owners”, then the question of distribution of wealth could be ignored. In order to promote the vision of citizen/owners, the political sector had to convince the public that the “monied interests” were under control and that financial reports would provide “truthful” data that could be relied upon for investment decisions. Opportunity for stock ownership became the new American frontier. This ain't the United Kingdom here. > don’t think you should be relying on regulation. Oh, I don't. Just caught the damned electrician having left out some little plastic insulators in metal-clad cable connectors, which protect the hot wires from being cut by sharp metal when things start shaking during a big earthquake, and left some popout openings in electrical boxes uncovered that have to be plugged before the wall closes, and gaps around the box openings larger than a quarter inch. No way do I rely on regulation. Of anything, for anybody. But having regulation means I can point to the electrical code and say you damn well fix that -- and not be told it's a generally accepted electrical practice not to always use the precautionary protections in every box every single damned time. Do remember that I don't have any suggestion for how everything could be made better. I'm just perplexed at how bad all the available choices seem to be for so many people, and suspect the table's tilted in fact while defined as flat and fair and even. [There's a problem with that which I hope you and the author can see, in that both sets of communications - to SEC, and to investors - were public. 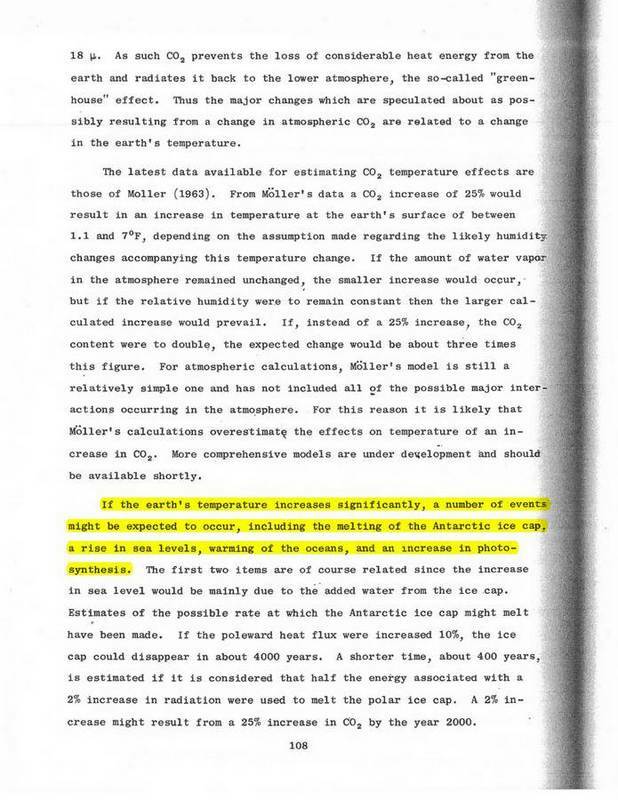 Here is NASA's view of the (un)predictability of climate change given the state of knowledge in 1998. Can't see how Exxon scientists could have known more about it in the 80s. ABSTRACT The forcings that drive long-term climate change are not known with an accuracy sufficient to define future climate change. Anthropogenic greenhouse gases (GHGs), which are well measured, cause a strong positive (warming) forcing. But other, poorly measured, anthropogenic forcings, especially changes of atmospheric aerosols, clouds, and land-use patterns, cause a negative forcing that tends to offset greenhouse warming. One consequence of this partial balance is that the natural forcing due to solar irradiance changes may play a larger role in long-term climate change than inferred from comparison with GHGs alone. Current trends in GHG climate forcings are smaller than in popular ‘‘business as usual’’ or 1% per year CO2 growth scenarios. The summary implication is a paradigm change for long-term climate projections: uncertainties in climate forcings have supplanted global climate sensitivity as the predominant issue. Looks like Alexander is possibly guilty of conspiracy now. I assume an investigation is pending.